December is an odd time to attract international delegates to an urbanist convention in Moscow: the city is dark 16 hours a day and the weather is bitter. The fourth Moscow Urban Forum (MUF)'s timing coincided with ominous economic news -- the price of oil, which underlines the Russian economy, was falling, and the rouble tumbled daily. Not ideal conditions in which to project Moscow as a progressive world city or trumpet the ambitious grand schemes the city has hatched to compete on the world stage. Nevertheless MUF attracted 5,000 delegates from 45 countries, including 13 international and six Russian mayors. It put on a grand show, and the city government made a case that not only did Moscow have a strong, contemporary urban vision, but that it could deliver as well, and hang the oncoming economic stormy weather. The venue, a stone's throw from the Kremlin, was the 1825 neo-classical Manege, by Spanish engineer Agustín de Betancourt and Russian architect Joseph Bové. It looks grand enough from the columned front, but step inside and a stunning Tardis-like interior volume opens up, 45m wide and 180m deep. Its mid-section gave plenty of room for corporate stands, slick info galleries, and the hospitality platform of Singapore, this year's partner city. Most sessions were in fair-sized basement rooms, but behind a 45m-wide curtain across the main space was the vast headline stage. 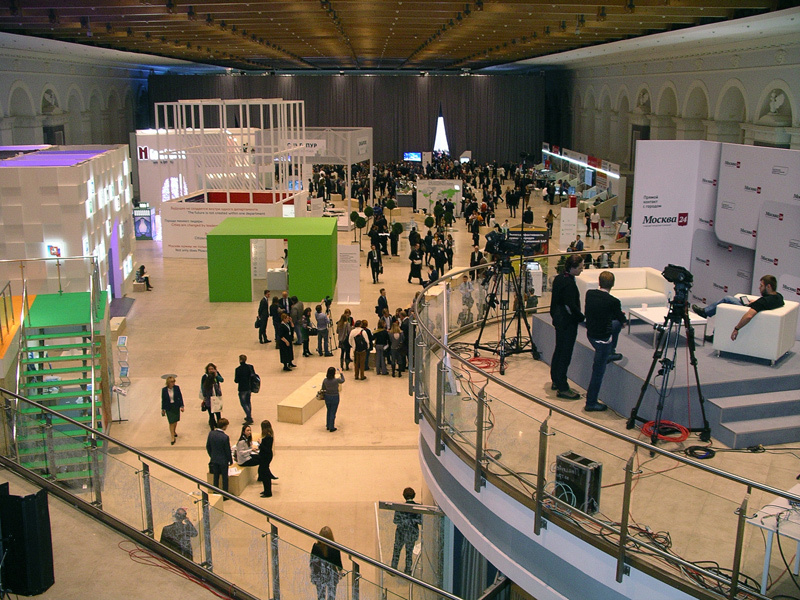 It was here that Moscow's mayor Sergei Sobyanin reigned over MUF's opening plenary. In 2010, the white-haired, ex-communist, Siberian-born Sobyanin replaced Yuri Luzhkov, who now lives in London, looks after bees and whose wife made billions in the Nineties' property boom. A Russian joke says a pager sufficed for him to communicate with the public. Luzhkov was dismissed by prime minister Medvedev, but Sobyanin is better connected to the federal government. Alexei Muratov, the switched-on architect and partner at think-tank Strelka, told Blueprint that there is 'some kind of dissonance' between government and city; they have different priorities. The new mayoral regime offered 'more attention to public spaces and the public', but even so 'all decisions are made in a very restricted milieu'. 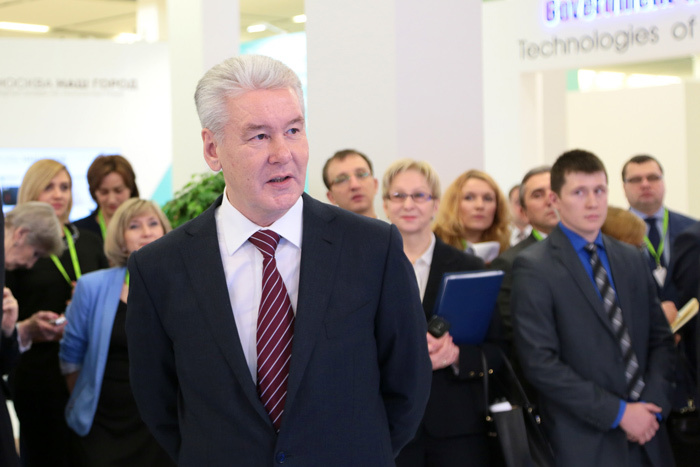 Taking to the stage, Sobyanin said (according to the Babel-fish of the real-time translation earpiece) that Moscow 'compares itself with other world cities' and that 80 per cent of Russia's financial flows, rail connections and science are in his city. He may look like a Politburo member but he talks in fresh language, about transport hubs and developing human capital, for example. Significantly, he said 'we need to meet people's needs'. He then sat with sphinx-like serenity at the centre of arrayed mayors and ex-mayors from around the world, including Teo Ser Luck of Singapore, Snehal Ambekar of Mumbai (where 'our main challenge' is to give shelter to the 50 per cent who live in slums), Bangkok's authoritative Sukhumbhand Paribatra (talking 'safe, clean and green' physical environment) and Hong Kong's development secretary Paul Chan. Tel Aviv's Ron Huldai urged everyone to visit his city with a laptop, shades and shorts. Tellingly, ex-Bogota mayor Antanas Mockus recalls that in 1999, his city was a 'saving device' in the Colombian economic crisis. Which is precisely what Russia faces, just as it rolls out plans of Soviet-scale ambition. 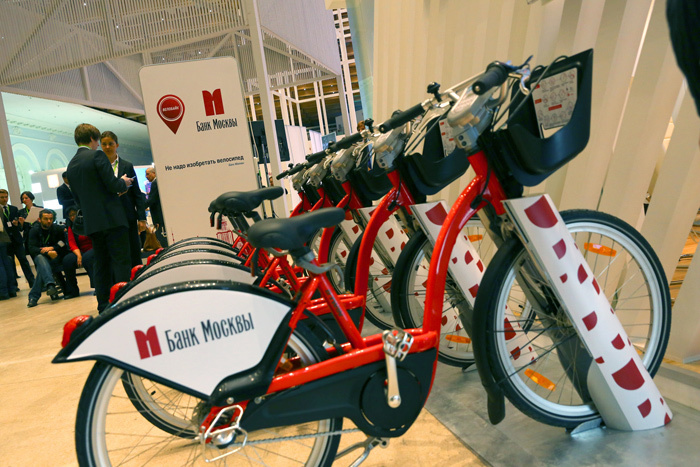 Biggest is New Moscow -- a new adjunct city that makes Rome's EUR or London's new towns look like hamlets. In 2012, Moscow annexed a vast swathe of territory to its south-west, more than doubling its area to 2,500 sq km, and the plan is to house a 1.5 million people there, create a million new jobs, develop 100 million sq m of real estate and build 6,000km of new roads in an expanse of lakes, techno-parks, hubs and boulevards. That requires a $200bn investment over 20 years. 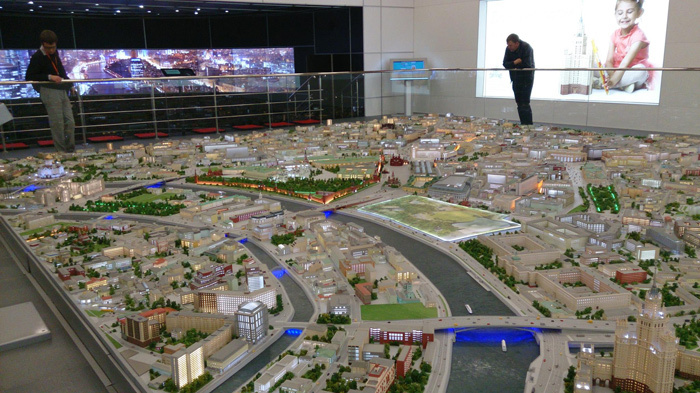 Out in the ex-Soviet showcase VDNKh Park, Sergei Levkin, Moscow's head of the Urban Planning Policy Department, was standing before a vast city 1:400 model, originally made for the 1967 Expo Montreal and updated by 80 experts. Blueprint asked how that was possible with the crisis. He replied that 'obviously the exchange rate will effect implementation, but construction is not dependent on imported goods' and anyway 'there's a programme of import substitution'. Marat Khusnullin, Moscow's deputy mayor for urban development (and sometimes-scourge of the modernist heritage lobby, who he dismisses for their 'cheap populism'), summarised the city's plans at a special press conference. Transport is at the heart of them, he said, and that over nine years 160km of new Metro are planned, with 79 stations, costing $306bn in total. Some 26km and 14 stations are already built. He freely admitted that 'we don't have enough from Russian investors, so we are talking to foreign investors' and has 'huge interest to co-operate with MTR' (Hong Kong's transit company that finances network expansion through property deals). If the current talks' 'decision is positive, we are ready to give the best terms we can'. Khusnullin, a charming bear-like presence who seemed to be everywhere at MUF, admires Dubai and says 'Russia should not be too focused on oil prices'. He's banking that Moscow's financial resources, and with more resident dollar millionaires than New York, mean that it 'will always be sustainable economically'. (Sadly, a Chinese company in a PPP to build a new Metro line has already withdrawn because of currency problems). Another grand projet is the Moscow River rehabilitation project, and at MUF the masterplan winner, from 216 entrants, was announced: local architecture practice Project Meganom. It hits all the right buttons -- understanding the city 'as one ecosystem', lots of public spaces (and decontamination plants), making a new 'city within a city' of the peninsular where the redundant Zil factory built the Soviet elite's limousines. In one graphic, a man and girl fish opposite the Kremlin, beside a wifi point. Another showcase project is Zaryadye Park, due to open in 2017 next to the Kremlin. The site was the monumental modernist Rossiya Hotel, but Putin allegedly came up with the parklife brainwave when visiting it in 2012 with Sobyanin. The pavilion exhibiting the plans also recycles Stefano Boeri's dome of QR codes from Russia's 2012 Venice Biennale pavilion. Not everyone is happy with how architects are being treated by the apparently go-go Russian planning system. In a room packed for The Role of Architecture panel session, Professor Grigory Revzin, another Strelka partner, took a devilishly provocative stand when he said 'only an idiot can become a member of the [architectural] juries', and 'now we are back to Soviet style of planning'. To applause and laughter, he called for architecture's future to be with oligarchs ('that's how we saved football') and smoke-filled rooms. At that session, Publica's Lucy Musgrave presented renderings of London neighbourhood public realm -- phone cameras snapped away -- and Barcelona's chief architect Vicente Guallart said that we don't need icons any more -- they were 'the invention of Gehry in the Nineties'. If there was any holistic vision of urbanist thinking about public space in the 21st-century city, it was given by URBANICA's principal and faculty dean, Pablo Allard of Santiago, Chile, in the final plenary session. 1. Scale it down to the neighbourhood. 2. Test design with participation. 3. Make spaces programmable and active. 4. Retrofit ('you're doing that with river' he told Moscow). 6. Foresee technology -- for example 'cars will navigate their own way in five years'. 7. Start sharing the city. Western clichés about Russia abound- its cold, crystalline beauty and warm spirits, heroic ambitions and blunting frustrations, its expanse and mystery. All apply to the aspirations aired at Moscow Urban Forum. Outside the Manege, the fresh Moscow snow had soon turned to grey slush, and started melting away into gutters. So too could Moscow's plans. No European megapolis is bigger, colder or facing heavier challenges than Moscow. Let's hope that Muratov was right when he offered that 'I'm more optimistic about Moscow than about Russia'.